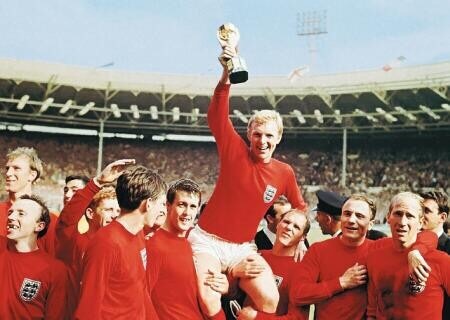 This week marks the 50th anniversary of England winning the World Cup in 1966. The winning line-up is well remembered, but what of their international careers after July 30, 1966? Today we recall what subsequently happened when they represented their country. England’s right back George Cohen initially remained a regular after the 1966 triumph and played seven more times until November 1967, when he featured in a 2-0 home win over Northern Ireland. Sadly that was to mark the end of the Fulham player’s international career after 37 caps, as Cyril Knowles and Keith Newton were selected in the matches that followed. It meant Cohen was the first member of the World Cup winning XI to leave the international scene, but he would also be the first to retire from playing when injury problems meant he had to hang up his boots a few months before his 30th birthday in 1969. Such disappointments were later put into perspective when he successfully fought cancer. Cohen’s fellow full back Ray Wilson would remain a regular for two years after the World Cup triumph. He won 12 more caps, taking his tally to 63. Wilson played in both the semi-final and third-place match at the 1968 European Championship, but the latter game against the Soviet Union would be his last for England. His career at the top was coming to an end and he would soon leave Everton for Oldham Athletic. England’s World Cup winning XI would all play in the next three matches before the side gradually began to change. When England faced Scotland in April 1967 in their fourth match after winning the World Cup, Roger Hunt was the first member of the celebrated XI to miss a game as he was replaced by Jimmy Greaves. But Hunt remained in demand for his country and had scored their first goal after the World Cup when he netted against Northern Ireland in October 1966. His last goal for England came against Sweden in May 1968, going on to play at Euro ’68. But after that he only appeared in two friendlies against Romania during the 1968-69 season, the 1-1 draw at Wembley in January 1969 marking his 34th and last cap – 15 of them collected after the 1966 World Cup. Later in 1969 he left Liverpool for Second Division Bolton Wanderers, as his career at the top level ended. England manager Alf Ramsey stood by Nobby Stiles after the player was condemned for a bad challenge on France’s Jacues Simon during the 1966 World Cup. But the midfielder would soon lose his place in the side. He played the first four matches after the World Cup, but would then be absent for more than a year before being recalled for the third-place play off at Euro ’68 against the Soviet Union when Alan Mullery was suspended. By then Stiles had won the European Cup with Manchester United but his days as an international regular were over. He won just three more caps, the last of them against Scotland in April 1970. Stiles was part of England’s 1970 World Cup squad in Mexico but he did not feature in any of the matches, as his international career ended with 28 caps – the lowest tally of the 1966 winning XI. In 1971 he was allowed to leave Manchester United for Second Division Middlesbrough. Like Stiles, England defender Jack Charlton would be part of the 1970 World Cup squad but was no longer a first choice player. Despite scoring twice in the first four matches after the 1966 World Cup, Charlton’s involvement became more sporadic and he did not play for England in the Euro ’68 finals in Italy. He returned to score against Romania in January 1969 and five more caps followed before the 1970 World Cup. He was left watching on for most of the tournament but was picked to start England’s 1-0 group stage win over Czechoslovakia. He was never picked again, with his England career having yielded 35 caps – 13 of them earned after the 1966 World Cup. Charlton continued to play for Leeds United until he retired in 1973. 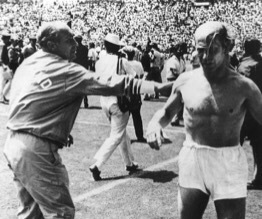 Jack Charlton was joined by his brother Bobby in leaving the England scene after the 1970 World Cup, as manager Ramsey began planning without his oldest players. The Manchester United star remained a key member of the side between 1966 and 1970, scoring a vital late winner against Spain in the first leg of the Euro ’68 quarter-final and then netting again in the third-place match against the USSR. By then he had won the European Cup with United and he had further cause to feel proud when he occasionally deputised for Bobby Moore as England captain. In April 1970 Charlton became only the second man to earn 100 caps for England, marking the occasion with a goal against Northern Ireland. The following month he scored his 49th and final goal for his country against Colombia. Bobby Charlton’s England career ends in sad circumstances in 1970. Aged 32, Charlton started all four matches for England at the World Cup in Mexico. But with England leading West Germany in the quarter-final, Charlton was substituted with one eye on conserving his energy for the next round. But they would not get there, England infamously losing 3-2 as Charlton’s international career ended in painful style with Ramsey being criticised for the substitution. Charlton bowed out with 106 caps and 49 goals – both England records at the time. He remained at Manchester United until retiring in 1973, although he would later resume playing duties while manager of Preston North End. England’s hat-trick hero in the 1966 World Cup final was one of five members of the side still involved after the 1970 World Cup. Still a relative newcomer even after the 1966 final, Hurst now properly established himself as a first choice forward and he would find the net during Euro ’68 against USSR. Other highlights included a hat-trick in a 5-0 friendly win over France in 1969 and scoring twice in a 4-1 victory over Scotland a few weeks later. Hurst scored the only goal as England beat Romania in their first match at the 1970 World Cup, but he would not net again during the tournament. Geoff Hurst playing for England against Greece in 1971. 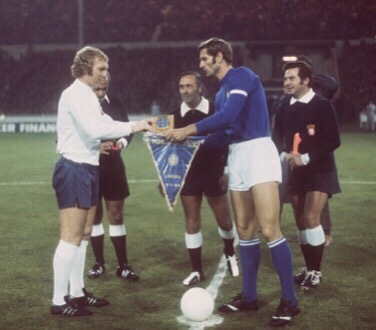 Hurst played a further right times for his country, helping them reach the quarter-finals of Euro ’72. During the first-leg defeat against West Germany at Wembley, Hurst was substituted and it would prove the end of his England career after 49 caps and 24 goals. Hurst’s first cap and finest hour had both come against West Germany and sadly his international finale was an anti-climax against the same opponents. The same year saw his long association with West Ham United end, as he moved to Stoke City. Legendary goalkeeper Gordon Banks was firmly established as England’s number one by 1966, with this status remaining pretty much unchallenged over the next six years despite being sold by Leicester City to Stoke City following Peter Shilton’s emergence. Banks played in the semi-final and third-place match at Euro ’68 and remained the regular goalkeeper going into the 1970 World Cup. That tournament would be remembered for his unforgettable save against Brazil but also for missing the quarter-final defeat by West Germany due to illness. “Of all the players to lose it had to be him,” rued manager Ramsey. 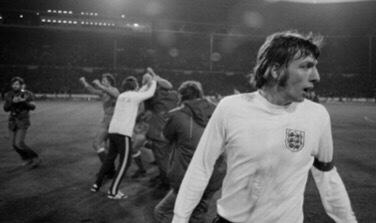 Banks helped England reach the Euro ’72 quarter-finals, playing in both legs as they lost to West Germany. Shortly after that Banks kept goal in Home Internationals matches against Wales and Scotland, but sat out a friendly against Yugoslavia in October 1972 as Shilton kept goal. Just days later Banks was involved in a car crash that cost him his sight in one eye and ended his professional career. He had earned 73 caps since making his England debut in 1963 and his class and experience was missed by England during their ill-fated qualifying campaign for the 1974 World Cup. England’s captain in 1966, Bobby Moore, would unsurprisingly remain almost an ever-present in the ensuing years. He helped England reach the semi-finals of the 1968 European Championship and two years later he was seen as pivotal to their hopes of retaining the World Cup. Moore was infamously accused of stealing a bracelet when in Colombia prior to the tournament and was arrested, but he showed great character upon his release to get on with the job in hand with England. He captained the side in all four matches in Mexico, making one of the most celebrated tackles in history during the iconic game against Brazil. Moore continued to lead the side as they reached the quarter-finals of Euro ’72, although he would lose possession in the build-up to the first goal West Germany scored as they beat England 3-1 at Wembley. However, Moore was still captain of the side going into qualifying for the 1974 World Cup and in February 1973 he won his 100th cap in a 5-0 friendly win over Scotland. But in a qualifier away to Poland in June he would take the blame for the second goal England conceded as they suffered a costly 2-0 defeat. Bobby Moore prepares to win his final England cap. Moore became England’s most capped player by appearing in friendlies against the USSR and Italy a few days later, but he was left on the bench for the vital return match against Poland in October as England failed to make it to the World Cup. Moore returned to captain the side in a friendly against Italy the following month (Ramsey’s final home match as manager), but it was his last act. After 108 caps, his England career was over and he would soon leave West Ham United and drop into the Second Division with Fulham. As well as being one of the two men to score for England in the 1966 World Cup final, Martin Peters was one of just two players from the final to represent them after Ramsey left in 1974. When England won the World Cup Peters had only eight caps and two goals to his name. He went on to earn a further 59 caps and net 18 more goals, remaining a regular for eight years. He scored against Scotland in February 1968 as England earned the draw they needed to reach the European Championship quarter-finals, where he netted again in the win away to Spain. Peters would start all four matches for England at the 1970 World Cup, scoring against West Germany as he became the only player to net for the Three Lions against the same opponents at successive World Cups. But he was substituted in the closing stages and, like Bobby Charlton, watched on as the Germans came back to win and send England home. 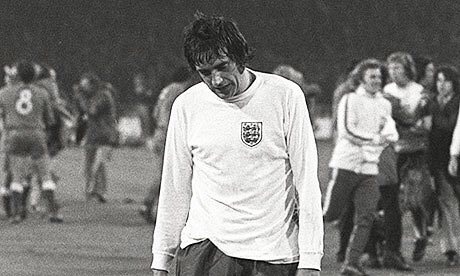 Despair for captain Martin Peters against Poland in 1973. Peters remained a key part of the England side under Ramsey, but he had to settle for coming off the bench when they drew away to West Germany and went out of Euro ’72 in the quarter-finals. Peters captained the side in a 7-0 win over Austria in September 1973 and did so again the following month for the do-or-die World Cup qualifier against Poland. He was the only player on the pitch who had featured in the 1966 World Cup final and it was to be a heartbreaking night as England failed to qualify after drawing 1-1. The clock was ticking on Peters’ England career. He appeared in Ramsey’s final two matches against Italy and Portugal, before being selected by caretaker manager Joe Mercer for the Home International defeat away to Scotland in May 1974. It was the only time Peters played under Mercer and permanent successor Don Revie would never select him. Peters continued to play top-flight football with Tottenham Hotspur and Norwich City until 1980. As the youngest member of England’s World Cup winning side it was perhaps appropriate that Alan Ball should be the last one still representing his country. 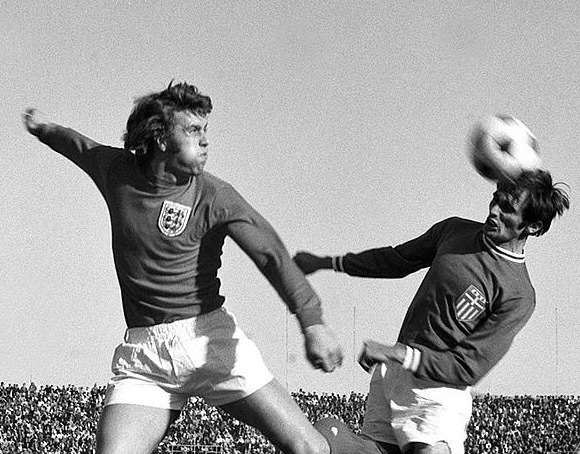 Ball remained a regular under Ramsey, helping England reach the semi-finals of Euro ’68 and featuring in all four games for them during the 1970 World Cup. Ball was again in the side for both legs of the Euro ’72 quarter-finals against West Germany and went into the qualifying campaign for the 1974 World Cup as one of just three players left from the 1966 final. Ball played in the win and draw against Wales but the defeat away to Poland would mark a real low point. Ball became the second England player to be sent off when he lashed out as tempers flared in the 2-0 defeat. He would not play for his country again until he came on as a substitute against Portugal in Ramsey’s last match as manager in April 1974. Ball made no appearances under caretaker manager Joe Mercer but new boss Don Revie handed Ball the captaincy against West Germany in March 1975. He would captain the side on six occasions before controversially being left out by Revie as England visited Switzerland in September 1975. It marked a sad end to Ball’s 10-year England career, as he finished with 72 caps. He continued to play professional football until 1983 but his England days were long over. There were no longer any players from the 1966 final still appearing for their country after 1975, but as we shall see it wasn’t quite the end of the story for the Boys of ’66 and the England team. Of the 11 England squad members who did not play in the final, there would be no further caps for Jimmy Armfield, Gerry Byrne, John Connelly, George Eastham, Ron Flowers, Terry Paine and Ron Springett. Jimmy Greaves played three more times for England after the disappointment of missing the 1966 final, all in 1967 with the last being a friendly win over Austria. Six of Peter Bonetti’s seven England caps were won after 1966, as he occasionally deputised for regular goalkeeper Banks. The most memorable was in the 1970 World Cup quarter-final against West Germany, where he was criticised for his display in a 3-2 defeat and never capped again. Norman Hunter looks dejected after England fail to qualify for the 1974 World Cup. Norman Hunter was the only non-playing squad member to properly establish himself later on, all bar four of his 28 caps being won after 1966. He would play in the Euro ’68 finals, come off the bench against West Germany in the 1970 World Cup and play in both legs of the Euro ’72 quarter-final against the same opponents. His last cap came in October 1974 against Czechoslovakia, a year after his costly mistake against Poland in the decisive World Cup qualifier. But perhaps the most intriguing case concerned Ian Callaghan, the Liverpool winger whose England career looked over after winning his second cap against France during the 1966 World Cup. After a staggering 11-year wait he was recalled at the age of 35 for matches against Switzerland and Luxembourg in 1977, meaning he was the last member of the 1966 squad to appear for his country. 1966 World Cup, England, What Happened Next?